Pokédex Entry This legendary Pokémon can scorch the world with fire. It helps those who want to build a world of truth. Appearance His fur is radiantly white, and silky to touch. He's usually a little bit smoky because of his tail. His eyes are bright and blue, metallic in luster. Resh is good in health, a bit underweight, but has managed not to sustain many apparent or serious injuries in the outbreak. His fur has a few patches of dirt and blood, but Reshiram doesn't tend to stay dirty for long. 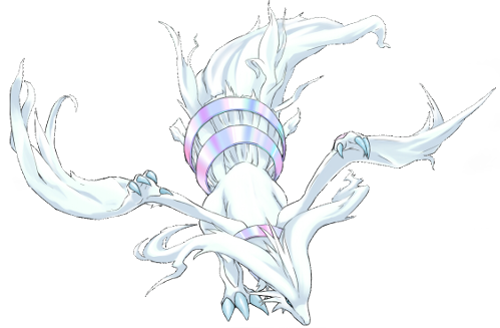 Personality Reshiram is relatively laid back, relaxed, contemplative, and overall welcoming. He’s quiet and relatively trusting of others because he expects it back, but he’s not gullible and can easily sense intentions. He’s wise, and is usually very empathetic with other creatures. He knows his brother as well as he knows himself, having once been merged with Zekrom. Since their last major battle with Blair and N, Zekrom has clearly pronounced his superiority over him, and it infuriates him to a blistering hot point. Reshiram would rather avoid conflict than engage, but against Zekrom it can be hard for him to stop his temper from snapping. He has a certain disdain towards humans, yet cherishes and values those who prove themselves respectable. Very focused on doing the right, true thing, no matter what. Honesty is his greatest virtue, and he does not tolerate lies. Reshiram’s trust is close to irreparable once it’s been very broken. He’s a realist, but leans a bit more towards pessimism than he’d like to admit. It counter’s Zekrom’s strong idealism with slight optimism. He can be pretty annoying and pretty harsh due to his brutal honesty, but he is always sincere with good intentions. He can be pretty quirky and smarmy in his casual conversations. Very adamant towards his goals. It's hard to take him down without him getting back up. Is really, really stubborn and solid about his beliefs. •Kinda has that nonbinary vibe. •Honest(l)y is this guy's middle name.